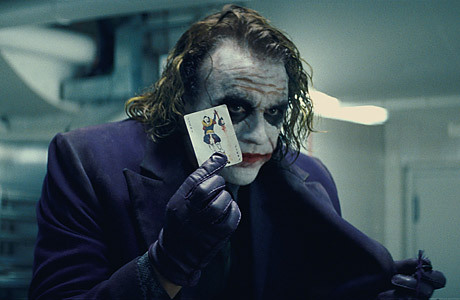 Ledger's death at 28, six months before his last big movie opened, stoked a morbid want-see. Was his Joker as extravagant and chilling as early reports suggested? Might the performance offer clues to Ledger's demise? Well, it's a wild and meticulous construct: the scourge of Gotham, stalking around like Groucho, talking in a nasal Chicago accent (the film was shot there), propelling every conversation by sticking his face close to that of his listener as if he could take a bite any second. Reviewers evoked Anthony Hopkins' Hannibal Lecter  the same mock-ingratiating tone, same sadistic ingenuity  but this Joker is the bigger, gaudier showman, with a sick kid's need to watch the damage he's caused. His ornate facial scars (possibly self-inflicted) suggest a traumatic past, but unlike Lecter the Joker has no backstory; he can't be read as the sum of what his parents, or a girl, or the Iraq War, did to him. He comes out of nowhere, creates chaos, disappears. Ledger thus had the freedom to invent his own nightmare. What a creepy-terrific job he did... before he, too, vanished.